Online crosswords are incredibly convenient, environmentally friendly, and generally very cheap. In fact, most of the crossword puzzles I download regularly are completely free! Even better, most of the highest quality crossword puzzles published in American newspapers today are available online. Online crossword puzzles are usually served up in one of two ways. Many crossword publishers, like the New York Times, offer both formats. In the first format, the crossword puzzle appears on the publisher's webpage, and you solve it interactively using the usual click & scroll keyboard functionality. 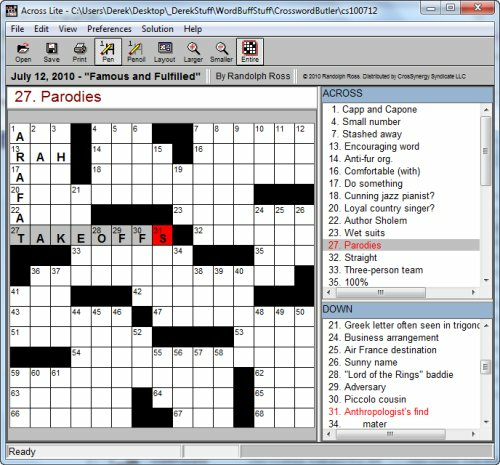 Usually, the crossword widget will only work properly in your browser if you have Java installed. You probably already have Java installed on your computer, but if you don't, it's no biggie — Java is free, safe and easy to download and install. The second way is to offer the puzzle for download. In this case you simply click on the download link and save the file to your computer. Once you have downloaded the puzzle to your computer, you then need to open it. To do this you'll need make sure you've installed the appropriate crossword solving program — most publishers nowadays use a free program called Across Lite, which is very easy to use. Here's me using Across Lite to make inroads into a CrosSynergy puzzle..
As you can see, there are enough excellent online crossword puzzles around to keep most solvers busy for the best part of the day, seven days a week. It's called Crossword Butler and it's completely FREE (a very reasonable donation is requested, but it's not mandatory). 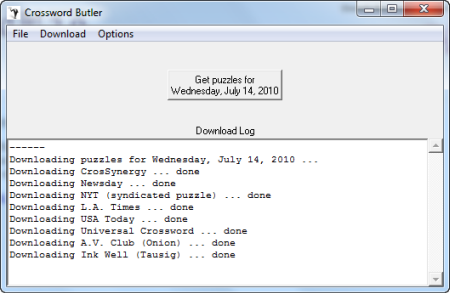 Crossword Butler is available for both Windows and Mac OS X, and is so easy to use that you'll be downloading today's crossword puzzles online in a couple of minutes! Oh... one more thing. You can download Crossword Butler here.